Termite is an easy to use and easy to configure RS232 terminal. It uses an interface similar to that of “messenger” or “chat” programs, with a large window that contains all received data and an edit line for typing in strings to transmit. The free Hyperterminal seemed to be missing, Now new and better feature rich terminals are available – Here’s one from CompuPhase who are our kind of people the EE kind. This terminal ought to help serial port SBC development. Realterm is a terminal program specially designed for capturing, controlling and debugging binary and other difficult data streams. The first microcontroller I became fascinated with was the 8048 (and 8748). This site has a lot of info on the 8048 and Z80, including an 8048 Development System. A Pascal powered Integrated Development Environment for 8051 Microcontrollers. It has a Project manager for Assembler and Pascal projects. MC-51 is an IDE for the 8051/80C31 and others. This is from the Institute of Experimental and Applied Physics – Microcontroller course pages. To communicate with a microcontroller experimentation board via the serial interface, MC-51 provides a terminal mode. The required parameters for the connection can be adjusted using the main menu. The microcontroller needs to be programmed with an appropriate monitor program (e.g. PAULMON).. The simulator lets you test small programs without any external hardware. It contains all common debugging features (Run, Stop, Single step, Step over subroutine, Run to selected line). You can execute the program step-by-step or set breakpoints anywhere in the program. The simulator displays the source code with program labels as well as the compiled hex code and the program addresses. All registers and memory locations can be inspected and changed if desired. Numbers may be displayed as hex, decimal or binary values. Here are BASIC-52 projects and some Atmel AVR projects.and audio projects like Balanced microphone preamp with phantom power. It also has the old PIC Archive. This 555 timer based PWM controller features almost 0..100% pulse width regulation using R1, while keeping the oscillator frequency relatively stable. The frequency is dependent on values of R1 and C1, values shown will give a frequency range from about 170 to 200 Hz. Any 555 chip will do, CMOS is fine as well. Most of these files are related in some way to my simple PIC16C84 programmer for IBM compatible PCs (download pic84pgm.zip and pic84v05.zip). You may find one or two packages that have more to offer though. A modern graphical IDE for microcontrollers based on 8051. MCU 8051 IDE is an integrated development enviroment. Supported programming languages are C and assembly. It has its own assembler and support for 2 external assemblers. For C language it uses SDCC compiler. This IDE contains simulator, source code editor, assembler, HW programmer and much other tools. Simulator supports over 79 MCU primarily from Atmel. Assembler, Simulator, Programmer, Debugger, C Compiler, BASIC Compiler, Pascal Compiler, Disassembler and Terminal Emulator. BASCOM-8051 is the Windows BASIC COMPILER for the 8051 family and BASCOM-AVR is the original Windows BASIC COMPILER for the AVR family. A web site that is dedicated exclusively to the 8052 mirocontroller, related products (both hardware and software), and 8052 derivative chips. This includes the traditional 8052, 8051, 8032, and 8031 along with more modern derivatives such as the Atmel AT89S8252, and many derivatives by Silicon Laboratories, Philips, and many others. The 8052.com SBC is a single-board computer designed to be both useful and instructive in illustrating certain concepts commonly encountered in 8052-based development. Designed to compliment The 8051/8052 Microcontroller Book that was authored by Craig Steiner, the webmaster of 8052.com. This is a nice educational reference project based on 89C2051, an 8051 derivative. 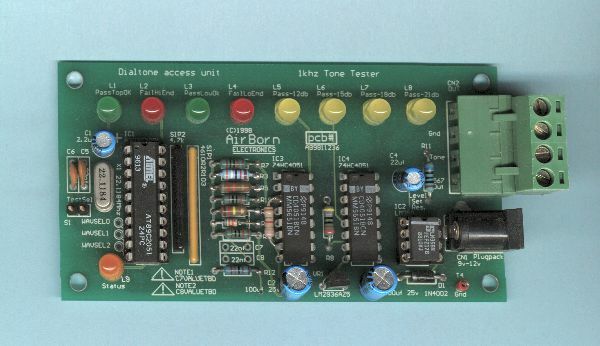 This uses the Uses analog switches to steer test tones and results. Programmed in assembler to produce pure 1khz tone. Students and Hobbyists can study all the example projects and tutors in this site to become more skillful. They have pages that show how a PCB is made and things like Circuit Design and Prototyping. This Site also happens to be one of the oldest resources in the web for Electronic Embedded Designs.